Blowout Sale! Up to 78% off on Electric & Battery Operated Staplers at Community Frontiers. Top brands include Artify Art Supplies, PraxxisPro, & Max. Hurry! Limited time offers. Offers valid only while supplies last. 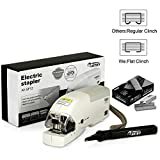 PraxxisPro - Powerhouse Flat-Clinch Electric Stapler - Premium Heavy Duty Stapler for 2 to 40 Sheets, uses Standard Staples.